General Sir Nicholas Houghton, the ex-Chief of the Defence Staff, was installed as the 160th Constable of the Tower of London in a traditional ceremony at the Tower of London on Wednesday, 5th October 2016. The Installation ceremony took place in front of an invited audience totalling some 600 spectators. The ceremony saw General Sir Nicholas Houghton being handed the gold master-keys of the Tower by the Lord Chamberlain, The Earl Peel, on behalf of Her Majesty The Queen symbolising the Constable‘s responsibility for this royal palace. 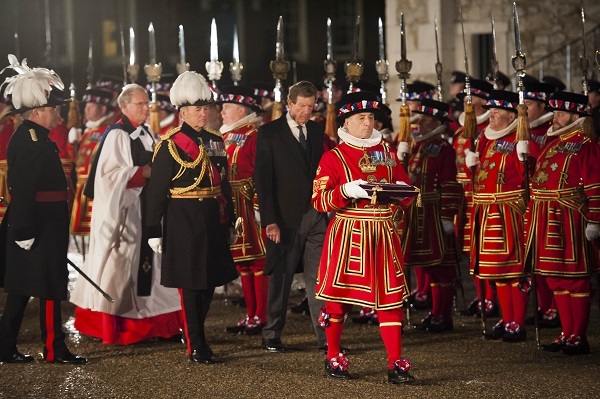 The Tower’s famous Yeoman Warders (Beefeaters) were also on parade in their scarlet and gold State Dress as well as General Sir Houghton’s previous regiment the 1st Battalion The Yorkshire Regiment. Other troops on parade included the 1st Battalion The Royal Regiment of Fusiliers, The Honourable Artillery Company, The Band of the Scots Guards and the State Trumpeters of the Life Guards. The role of Constable is the most senior appointment at the Tower, acting as the monarch’s representative, and is one of the most ancient offices in England, dating back to within a few years of the Norman Conquest. In the past, this appointment has been held by eminent prelates of the Church, prominent politicians and distinguished soldiers. Today the 5-year appointment is predominately a ceremonial role, but also includes becoming a trustee of both Historic Royal Palaces, the independent charity that cares for the Tower, and the Royal Armouries. Following the ceremony, Moving Venue by Smart proudly catered for guests at three canape receptions, held in various sections of The Tower of London including the new Armouries and the Yeoman Warder Club. 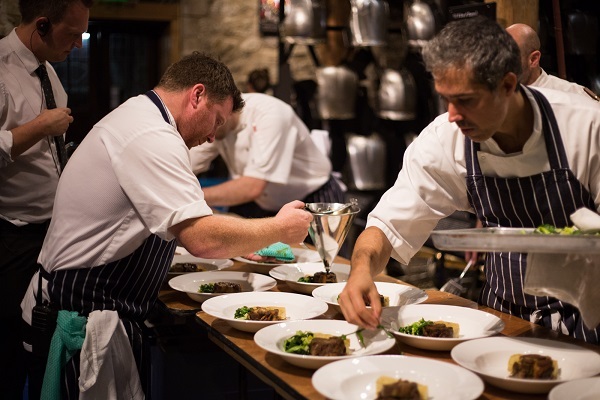 This was followed by a three course dinner in the White Tower, overseen by Simon Packer, Moving Venue’s Head Chef. Guest tucked into an exquisite three course dinner, which consisted of shoulder of Cornish lamb, slow roasted with herb potato galette, ratatouille with Lilliput capers and rosemary and garlic lamb jus. For dessert, guests were served a salted caramel peanut butter slice, with a cocoa nib tuile, frosted nuts and milk ice cream.